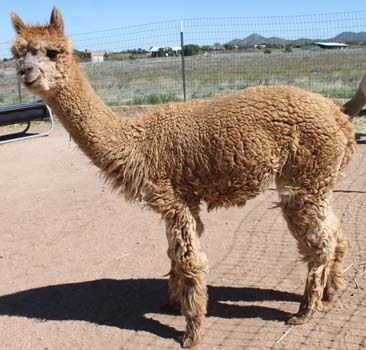 Crescent Moon’s Galaxy is a handsome light brown 4Peruvian Legacy 6016 grandson, out of medium fawn Crescent Moon’s Helios. Galaxy’s pedigree not only includes the famous full Peruvian Legacy, but also impressive Chilean lineage contributing considerable true black genetics. He displays all the superior features associated with this elite lineage: Well-proportioned with excellent conformation, strong bones, a great head, and a perfect bite. Galaxy’s fleece is notable not only for its rich color but also for its softness as well as its strong crimp, accompanied by extreme density and coverage. Galaxy’s show record attests to his superior qualities, with consistently high placings in the events in which he was entered as a juvenile male. Strong foundation genetics also typify Ginger’s dam, white MS Mary Jane, whose sire was full Peruvian Nirvana’s Augustus. Moreover, Dom Lucilio, a prestigious full Peruvian herdsire and Royal Fawn son, was Mary Jane’s grandfather on her dam’s side. 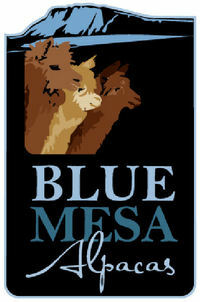 BlueMesa Ginger is a lovely medium fawn female with wonderfully soft, crimpy, fine fiber, as well as excellent conformation and fantastic Legacy genetics! Ginger has a strong color pedigree on her sire’s side, who comes from foundation Legacy line stock. 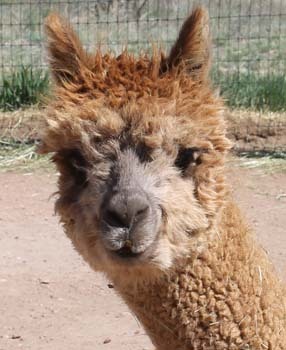 Crescent Moon’s Galaxy is a handsome light brown 4Peruvian Legacy 6016 grandson, out of medium fawn Crescent Moon’s Helios. Galaxy’s pedigree not only includes the famous full Peruvian Legacy, but also impressive Chilean lineage contributing considerable true black genetics. He displays all the superior features associated with this elite lineage: Well-proportioned with excellent conformation, strong bones, a great head, and a perfect bite. Galaxy’s fleece is notable not only for its rich color but also for its softness as well as its strong crimp, accompanied by extreme density and coverage. Galaxy’s show record attests to his superior qualities, with consistently high placings in the events in which he was entered as a juvenile male. In sum, Ginger reflects her quality foundation lineage on both her sire’s & dam’s sides in her own great conformation & classic head structure as well as her beautiful fleece qualities. Thus Ginger has a superior combination of qualities that would make her a wonderful addition to your breeding program!